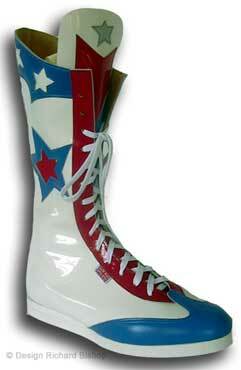 Example image above shows high leg lined White patent wrestler boot with red & blue star set inset. Custom ringside promotion wrestlers begin life as one of our popular classic range either patent or natural hyde leather and fully lined .Size range 5-12 although we can manufacture up to size 16 please ring or email for a quote. Basic cost is £185 then each additional letter/star or design work doubling up on each boot is a further £10. You can have any colour combination you wish which again is another £10 on top of the classic price. For additional work email before buying . White Patent wrestler with red & blue stars.